Governor Tom Wolf and Philadelphia Mayor Jim Kenney announced a big change coming to a well known destination in Center City. 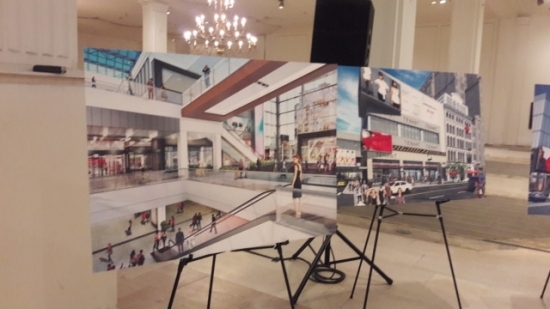 They announced today that the Gallery in Center City is now being renovated to become The Fashion Outlets of Philadelphia. The outlet is said to be one of the best new shopping destinations in the region with many shops from the biggest designers. As well as bringing a new destination to Philly, the building of the Outlet will create over 2,000 construction jobs, as well as 2,300 jobs once the outlet is built. The outlet is set to be opened in Spring of 2018. The woman who died this morning after a New Jersey Transit train crashed into the Hoboken station has been identified. 34-year-old Fabiola Bittar de Kroon was pronounced dead after a piece of debris fell onto the platform. De Kroon was not a passenger on the train, she was standing on the platform when the train crashed into the station. The total number of injured in the crash has reached 114, with two of the injured sustaining life threatening injuries. The National Transportation Safety Board is still running an investigation on the crash. After almost two years of renovation, The Philadelphia Museum of Art is ready to open up its newest gallery to the public. The Art Museum will now have a new and improved gallery filled with South Eastern Asian art. The gallery will be filled with many statues of Indian Gods as well as a vast array of tapestry's that fill the walls of the gallery. Art Museum officials say that some of the pieces have been in the museum for well over 100 years, while others they have just acquired during the renovations. The doors to the gallery are set to open this Sunday October 2nd. The Phillies play at home tonight against the Mets. Today, Rainy, and a Flash Flood watch in the Philly Area, and a high of 64 degrees in Center City.